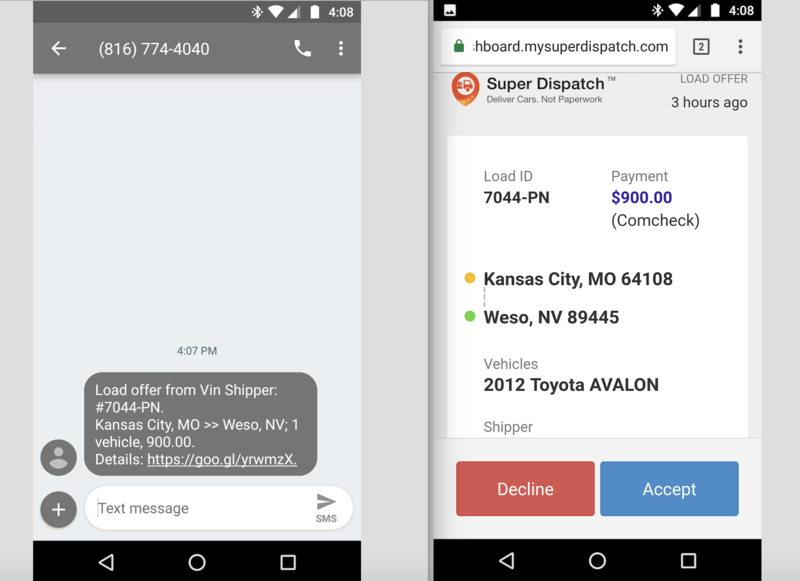 In order to avoid unnecessary status update calls and have access to inspection photos that protect you, the carrier, from damage claims, brokers are sending load offers through Super Dispatch. 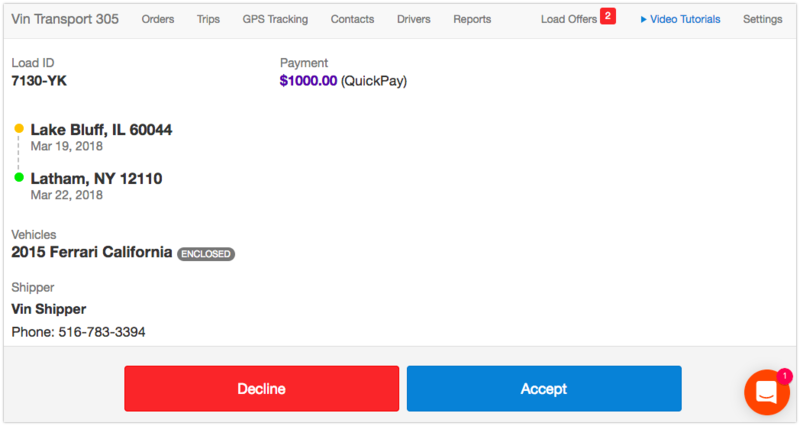 Regardless if you are already Super Dispatch user or not, you can easily get started at no cost. With our free mobile app you will be able to do detailed inspections with photos and have clean professional BOLs with your company logo on it. the email address listed in your Carrier Profile page of Super Dispatch. Broker will confirm your company name with you based on the match in our system. phone number where you would like to receive a text message with the offer. 1. Go to Load Offers section on the top right corner of your web dashboard. Then Accept or Decline the offer. After accepting the offer you will see that load inside of your New Load tab. Now it is ready to be assigned to any driver. 2. 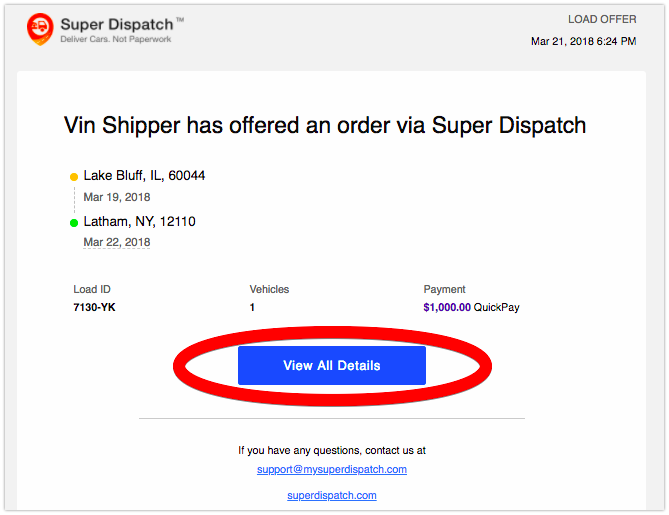 Open the email received from Super Dispatch with the load offer. Click on View All Details button. Then Accept or Decline the offer as it is shown above. After accepting the offer you will see that load inside of your New Load tab. Now it is ready to be assigned to any drivers. 3. Open the received text message. Tap on the link next to Details. Then Accept or Decline the offer. 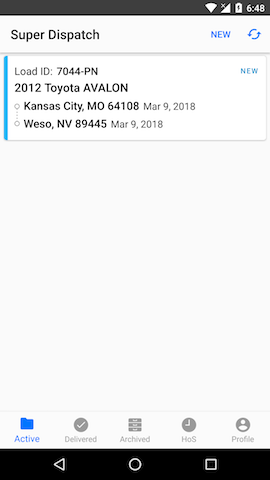 Since you are accepting the load on your mobile phone and already have the Super Dispatch app, you should see the new load inside the Active tab. Now you can do a detailed inspection, collect signatures and share BOLs. We suggest to take as many inspection photos as possible in order to avoid any false damage claims.